Living in the Pacific Northwest and especially in the Puget Sound area, we have been spoiled with our ability to spend recreational time out in the wilderness, fishing and harvesting various shellfish. With more than 10,000 rivers and streams leading into Puget Sound, and thousands of miles of beach and boat access, there are few excuses not to get outside and have some fun. This summer, being an odd-numbered year, will host the return of millions of pink salmon (Oncorhynchus gorbuscha). In fact, Washington Department of Fish and Wildlife (WDFW) has projected a run of 6.5 million fish. There are also salmonid species of sea-run cutthroat trout to seek out year round and a wide variety of bottom-dwelling fish in the sculpin family that can consistently be found. With all of the various opportunities on the water, you must keep in mind the state regulations that help preserve the wildlife for future generations. When it comes to chasing fish in Puget Sound, one of the most important things to do is check the WDFW fishing and shellfish harvest regulations pamphlet. This year, in order to better regulate the seasons for salmon returns, WDFW has changed the regulation pamphlet update from May 1 to July 1, and it will remain this way for the foreseeable future. Even if you are only a catch-and-release angler, pay attention to the emergency rules, as anything that pops up there will take precedence over the original rules in the pamphlet. To avoid fines, make sure you only use single point barbless hooks, with a maximum of two hooks per line, in Puget Sound. The only exception is using jig tackle for forage feeders. When using rod holders or downriggers, make sure that everything works properly, meaning you can quickly access your rod and play the fish without getting caught up. It would be a shame to get a fine for faulty gear! 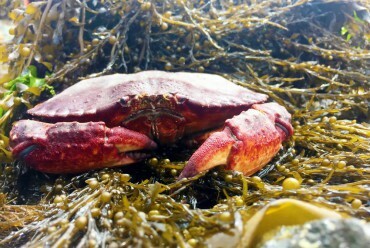 If fighting fish isn’t quite your speed, Puget Sound also offers a plethora of crab and shellfish to be found and harvested. The regulations in place are even more crucial, in order to not only preserve shellfish populations, but also your own health. Throughout the year, WDFW may close certain shellfish-harvest opportunities due to events like toxic algae blooms or chemical spills. Shellfish are filter feeders; it is possible for toxins to accumulate in their bodies, leading to potential illness or death if they’re consumed. To make the most of the opportunities that Puget Sound offers, make sure you use all available information resources. This includes checking out the Fish and Wildlife regulation pamphlet at WDFW.wa.gov and visiting your local fly shop or stores like Cabela’s or Bass Pro Shop that have a fishing department. These resources will provide answers for any questions you may have, and point you in the right direction to your catch of choice. Alec George is a summer intern for Harbor WildWatch, helping teach about the wildlife of Puget Sound and the surrounding waters to the community. He graduated from Central Washington University, and having spent much of his free time on the local rivers, decided to pursue a career involving aquatic and marine wildlife. He enjoys flyfishing, rock climbing, camping and many other outdoor activities.